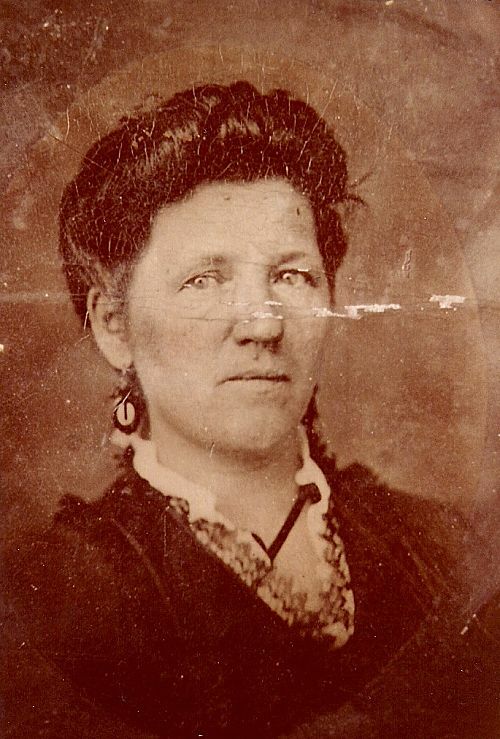 Emma Adam Herms in the youngest daughter of Conrad and Adalbertha Bergmann Adam. Boerne Cemetery (Boerne, Kendall County, Texas). Christian and Emma Adam Herms marker; personally read, 2011. Celebration? Relatives visiting on Sunday afternoon? I don’t know, but I love the picture! The family is posed in front of the Julius Adam home on a sunny day in 1912. Adalbertha Bergmann Adam is front row center. On her left is Bertha Adam Froebel Haby, her daughter, Erna Adam, her granddaughter, has her hand on her chair, on her right is Kathinka Adam Toepperwein, her oldest daughter. Eugene Adam, grandson; Paul Toepperwein, son-in-law; Emma Herms, daughter; Wally Toepperwein, granddaughter; Gus Herms, grandson; Clara Toepperwein, niece; Ida Haufler Adam, daughter-in-law and my great-grandmother; Hilda Adam, granddaughter; Bertha ? ; there is a man standing behind Bertha I can’t see his face clearly; Edna Herms, granddaughter; Julius Adam, son; Mousie Goerges, niece; Chris Herms, son-in-law; Willie Adam, grandson and my grandfather. 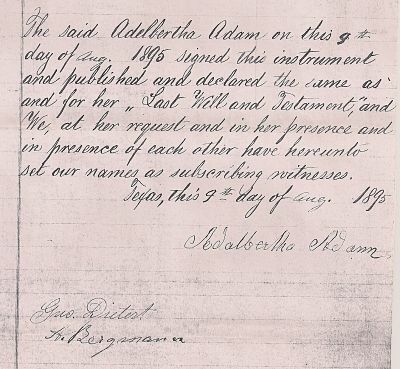 Adam, Adalbertha. Adam Descendants at the Julius Adam Home 1912. Photograph of the original. 2000. By Gunner Froebel. Digital copy privately held by Regina Adam and Kathryn Adam-Hurst. Boerne, Texas. 2011.